Sinai Health Systems recently organized a health care series, an initiative to create awareness and educate community residents about living healthy lifestyles, by providing resources and caregiver information in both English and Spanish. One of the long-standing yet vital health care issues today is a person’s commitment to healthy practices on a daily basis, a preventative healthcare measure that saves lives before a medical emergency arises. Yet statistics reveal that Latinos do not consistently meet with a doctor, which leads to a higher probability that potentially detrimental health conditions could worsen if left untreated. According to an extensive 2012 study by the Pew Hispanic Center, more than one fourth of Latino adults in the United States lack a usual healthcare provider. Forty-one percent of Latinos said that they did not need a usual healthcare provider, while 13 percent of Latinos said that they could treat themselves. 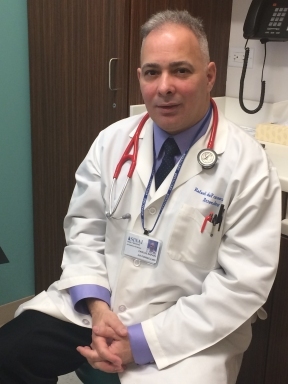 For Sinai Medical Group family physician Dr. Rafael DaFonseca the idea of encouraging people to visit the doctor at least once a year poses great obstacles. “This is the most difficult question. Everybody’s different. In some cultures going to the doctor is for them only if they’re going to die, otherwise they don’t go,” Dr. DaFonseca said. Before people reach that crisis point in their health status, Dr. DaFonseca said quitting smoking, regular diet and exercise, and drinking lots of water are the core tenets to any healthy lifestyle and will be beneficial for individuals and families in the long run. Dr. DaFonseca also adds the importance of yearly pap smears for women over the age of 18, mammograms for women over the age of 40, and an increased effort in sexual education for youth and adults in order to prevent contracting sexually transmitted infections. In order to combat these community health challenges, Sinai Health Systems established the Sinai Community Institute (SCI) in 1993, an organization focused on developing neighborhood-health and social service programs for the communities of North Lawndale, South Lawndale, West Garfield Park, East Garfield Park and Pilsen. SCI programs include the Illinois Subsequent Pregnancy Program (ISPP), which supports adolescent mothers through caregiver training, the Whole Foods Market Smart Shopper Initiative, which teaches families about eating well, and the Family Development Initiative, which focuses on childhood development and family intervention services. It’s the collaborative effort of Sinai Health Systems’ doctors, nurses and administrators to educate the public about health that makes the message of preventative care through healthy life choices all the more urgent. Sinai Health Systems will host an Affordable Care Act enrollment event honor Dr. Martin Luther King Monday, January 20, 2014 at Holy Cross Hospital, located at 2701 West 68th Street in Chicago from noon to 7 p.m. Walk-ins are welcome. Prescheduled appointments will be taken at 2735 West 69th Street in Chicago. To make an appointment, call 773-884-9350. For more information on Sinai Health Systems’ health care series, programs and services, visit www.sinai.org. © 8112 Chicago Hispanic Newspaper, Lawndale News, Hispanic Bilingual Newspapers, Su Noticiero Bilingue. All rights reserved. XHTML / CSS Valid.